KPLO (Korea Pathfinder Lunar Orbiter) is South Korea's first lunar mission. Wide-Angle Polarimetric Camera (PolCam) – PolCam will acquire the polarimetric images of the entire lunar surface except for the polar regions with medium spatial resolution in order to investigate the detailed characteristics of lunar regolith. KPLO Magnetometer (KMAG) – KMAG will measure the magnetic strength of the lunar environment (up to ~100 km above the lunar surface) with ultra-sensitive magnetic sensors. 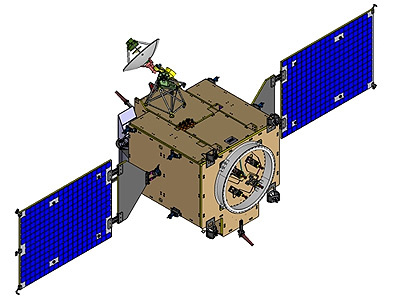 KPLO Gamma Ray Spectrometer (KGRS) – KGRS will investigate the characteristics of lunar resources including rare elements, minerals, etc., and map the spatial distribution of the elements. Disruption Tolerant Network experiment payload (DTNPL) – DTNPL will take space communication experiment based on disruption tolerant network technology. NASA's ShadowCam will map the reflectance within the permanently shadowed regions to search for evidence of frost or ice deposits. The instrument’s optical camera is based on the Lunar Reconnaissance Orbiter Narrow Angle Camera, but is 800 times more sensitive, allowing it to obtain high-resolution, high signal-to-noise imaging of the moon’s permanently shadowed regions. ShadowCam will observe the PSRs monthly to detect seasonal changes and measure the terrain inside the craters, including the distribution of boulders. The launch is planned for the end of 2020. SpaceX will launch KPLO on a Falcon-9 v1.2 (Block 5) from Cape Canaveral. KPLO will enter a polar orbit around 100 km above the moon.